POW! WOW! Worcester, a celebration of art and culture, will take place August 26 – September 4, 2016. POW! WOW! Worldwide, a producer of international mural festivals, will make Worcester its first ever East Coast festival. The weeklong festival known as POW! WOW! Worcester will appeal to a diverse audience with multiple styles of murals, providing local and international artists with a wide array of local building facades to design. Ancillary events will take place throughout the city and include an artist talk, art fundraiser, musical performances and an outdoor celebration with a centralized hub in downtown Worcester. Jasper Wong, founder and creator of POW! WOW! Worldwide offered, “It’s one of our goals at POW! WOW! to help beautify cities with murals throughout the world. We’ve been in Hawaii, Long Beach, Taiwan, Hong Kong and Japan. 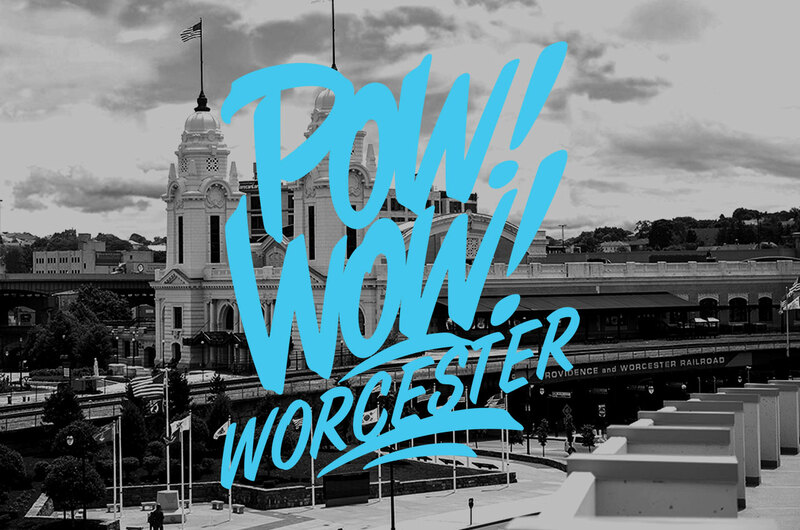 Worcester is another great addition and we’re excited to put up amazing murals around the city.” With firm commitments in place such as a grant from the Worcester Arts Council for the Palladium wall, POW! WOW! Worcester will raise the city’s artistic profile and further establish the city as a cultural destination. Public art has a profound effect on a community as proven by similar events hosted in major cities across the U.S. The City of Worcester has become a vibrant hub of cultural celebrations over the years, hosting a variety of festivals and daylong events to honor different communities, such as the annual stART on the Street. POW! WOW! Worcester seeks to continue that success. The roster of artists involved includes both local and internationally renown artists.